Qawra Point dive site is located on the northeast coast of Malta, around the peninsula at the end of Qawra in the northern tip of St. Paul’s Bay. On the north side of Qawra Point are Fra Ben Cave, a small cavern with an open ceiling, and North Reef & Arch. 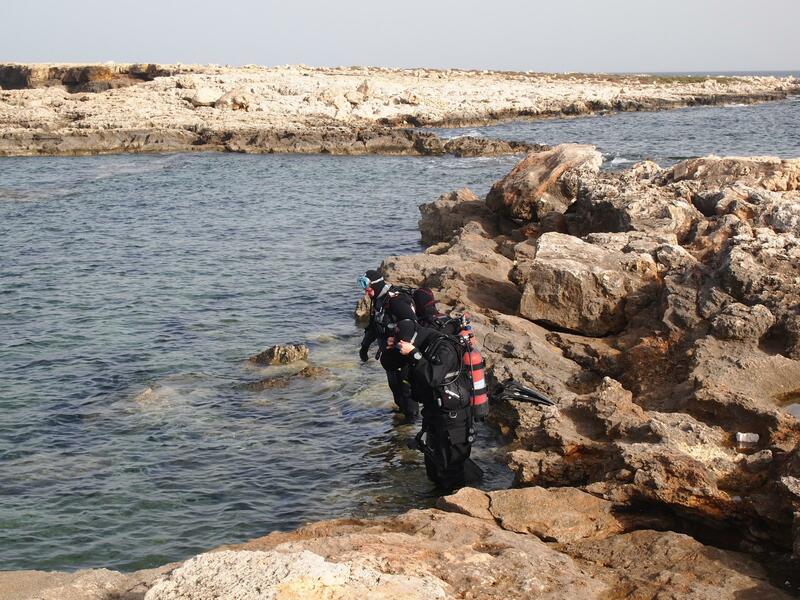 On the south side of Qawra Point there is a shallow bay suitable for training and try dives. Between north and south side is a shallow rock-cut pool. A bit farther away from the shore are L-Cave, Qawra Reef and Imperial Eagle wreck with Statue of Christ nearby. These sites are usually dived from boat. Qawra Point is great place for swimming, snorkelling and sunbathing too. The area has parking, restaurants, cafes, and public toilets. Also worth visiting is nearby Malta Aquarium. Fra Ben Cave is shallow cavern dive on north side of Qawra Point. Fra Ben Cave entrance is 100m from entry point at 6m depth. Cavern has an open ceiling. North Reef & Arch is offshore reef dive on north side of Qawra Point. Wall reef drops from 10m down to 15m. Near the reef there is little arch 18m deep. Qawra Bay is shallow dive site on south east side of Qawra Point. This sheltered bay is suitable for training and try dives. Seabed is sand and seagrass. L-Cave is deep swim-through cave dive off Qawra Point. L-Cave is quite tight L-shaped tunnel with sandy bottom located in small valley at depth around 33m. Qawra Reef is offshore dive site off Qawra Point in Malta. Qawra Reef has nice wall with several big beautiful caves/caverns. Depth of dive from 15m to 40m. ★★★☆☆ A bit hard to reach the water, but nice cave / reef to explore.